Atheneum Books for Young Readers, 9780689876684, 40pp. A beautiful baby, a sinister spell, a pricked finger, a hundred-year sleep, a true-love wake-up kiss. 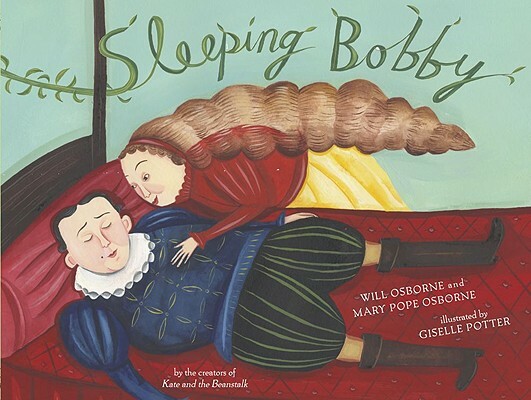 We all know the story of Sleeping Beauty, but not the one that Will and Mary Pope Osborne tell -- with a handsome prince named Bob, a feisty princess who wakes him from his enchanted slumber, and charming artwork from acclaimed illustrator Giselle Potter. Here's a fresh, magical reworking of the classic fairy tale that's sure to have kids begging, "Read it again!" As soon as he touched the wheel's spindle, a splinter pricked his finger. "Good night, Bobby," said the old woman.